Can you believe it’s been 5 years since Tiger won a Masters Tournament Championship? I asked myself, is it too late for Tiger? Has his prime passed, and will he ever don a green jacket again? There have been plenty of champions that have gone through a 5-year or more rough patch to regain glory. 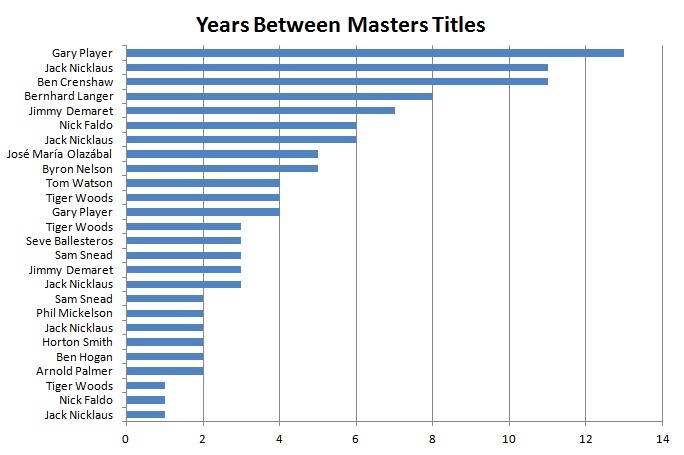 ﻿The average length of time between wins is 4 and the median is 3, both lower than where Tiger sits. However, Gary Player, Jack Nicklaus, and Ben Crenshaw survived 10+ year droughts. So, it’s obvious that one shouldn’t count out an elite player like Tiger Woods now, or any time soon. I also looked at winners of 3+ champions to determine the length of time between first and last victories (Tiger is in his 13th year since his first win). Jack Nicklaus (23) and Gary Player (18) have both won tournaments farther apart than Tiger. Jimmy Demaret (10), Nick Faldo (8), and Arnold Palmer (6) never found glory as late after their first win. I was surprised that there has been a repeat winner 42 times (58% of all championships), which is an astounding figure for a tournament with such a long history. Perhaps the limited field makes it easier for repeat champions to survive random chance. Further, these 42 championships were won by a mere 16 men. If you thought one green jacket was an accomplishment, the double-green jackets are quite an elite group.